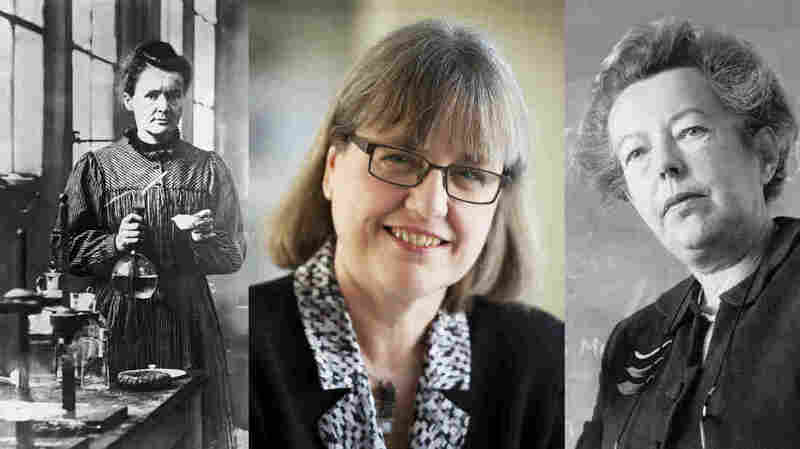 The Nobel Prize In Physics: 117 Years, 3 Women And Counting Donna Strickland is the first woman to win the prize in a generation. Other women in physics are not surprised, but some hope change may be coming. Marie Curie (left), French physicist and winner of the 1903 Nobel Prize for physics, Canadian Donna Strickland (middle), who won the 2018 prize for her work with lasers, and physicist Maria Goeppert Mayer (right), who won for her work in atomic physics in 1963. But there haven't been. Only the famous scientist Marie Curie and Maria Goeppert Mayer, a nuclear physicist, have won the prize. Curie won in 1903 for her discovery of radioactivity, and Goeppert Mayer in 1963 for theoretical work on the structure of the atomic nucleus. Strickland's win was announced Tuesday morning at the Royal Swedish Academy of Sciences in Stockholm. She and French physicist Gérard Mourou won a quarter of the prize each for their work creating super-bright, super-fast pulses of laser light. Separately, Arthur Ashkin won half the prize for work using laser light as a kind of tweezer to pinch and move physical objects. Strickland's work with Mourou was critical to making lasers the powerful instruments we use today, says Margaret Murnane a physicist at JILA in Boulder who specializes in laser science. The technique is known as chirped pulse amplification, and Murnane says "it really was a key enabling discovery that really allows us to use all the power of laser light." The technology has already been used for eye surgery and laser cutting, Murnane says. In the future may even be the basis for particle accelerators. Other physicists were elated at the news of Strickland's win. "I think it's fantastic," says Joanne Cole, a particle physicist at Brunel University London in the UK. "It's about time." "Working in a lab with a bunch of laser jocks? It's great, it really is," says Jane Luu, an astronomer at MIT's Lincoln Laboratory. The fields of physics and astronomy have a long history of being male-dominated, and struggling with sexism. Albert Einstein was notorious for his poor treatment of his first wife, the mathematician Mileva Maric. In his autobiography Surely You're Joking Mr. Fenyman! the famous American physicist Richard Feynman boasted of working on his equations in strip clubs. More recently, the fields have been experiencing a #MeToo moment. In 2015, the prominent planetary scientist Geoff Marcy was forced out of UC Berkley after he was accused of sexually harassing students. Earlier this year, cosmologist Lawrence Krauss was forced to step down from his position at Arizona State University over allegations of sexual misconduct. And on Monday, a theoretical physicist at Europe's primary particle physics laboratory was suspended after claiming the field was built by men. "The vast majority of women that I've spoken to have experienced some sort of discrimination or harassment on account of their gender," Cole says. Donna Strickland was surprised to learn she was only the third woman to win the prize. Luu says she herself has frequently experienced discrimination, sometimes unintentionally. For example, when she brought male graduate students to a telescope, "I was always assumed to be the student, and my student was always assumed to be the person in charge of me," she says. But Cole and Luu add that the real issue starts much earlier. As early as elementary school, the gender gap in physics and math begins to open. And with each level of education, the number of women studying in the field drops. "By the time they get to grad school and the lab, there are not that many of us," says Luu. Here in the U.S. the gap in women earning physics degrees has stubbornly persisted. For the past decade, only about 20 percent of bachelor's and doctorates in physics have been held by women, according to data held by the American Physical Society. The number of doctorates dropped slightly to 18 percent in 2017, the latest year for which data are available. "We've tried really hard to encourage more women into physics, but it just doesn't seem to be happening," Cole says. Luu says she believes continuing lack of women in the field is clearly part of the reason why the Nobel Prize has gone to so few women. Nobel Prizes must be nominated, and Luu suspects there just aren't that many female candidates. "I don't know what fraction, but there will be thousands of nominations for men, and five nominations for women, something like that," she says. "It's a small percentage, that's for sure," says Goran Hansson, the secretary-general of the Royal Swedish Academy of Sciences during Tuesday's press conference. Hansson says that the academy was taking measures to ensure more women are nominated, though he did not elaborate. "We don't want to miss anyone." The Nobels are no longer the only science prize in town. In recent years, other prizes funded by wealthy tech entrepreneurs have begun to spring up, offering scientists different opportunities for cash and recognition. This year, Jocelyn Bell Burnell, an astronomer widely held to have been overlooked for a Nobel Prize, won the Breakthrough Prize for her discovery of a kind of star known as a Pulsar. Luu herself won another prize, the Kavli Prize, in 2012 for her work on icy objects at the edge of the solar system. "The year I won, there were four women," she says. "That was pretty cool."